Yesterday we held yet another virtual Teachmeet. Just like the previous three teachmeets, this one was a true celebration of teaching, learning and sharing. There were 16 speakers from 16 countries from across six continenets. They talked about eTwinning projects, classroom publishing, concept mapping, Edmodo, extensive reading, writing, gaming, entrepreneurship, mentoring teachers and Wordle, just to mention a few. The atmoshpere was incredible - you could feel the immense enthusiasm, energy and passion that radiated not only from the speakers, but also from the audience, both in the chatbox and on the stage. In July 2011, I was proud and honored to be one of the top 50 educators selected by the Microsoft Partners in Learning Network to take part in the first PIL Institute that was held at the Microsoft Headquarters in Redmond, WA. This event has greatly impacted both my professional and personal life - it influenced the way I teach, the way I learn and the way I connect with educators worldwide. I'm still in close contact with most of the educators from Seattle - on the PIL Network and on our Facebook page, fondly nicknamed the Dirty Fifty. 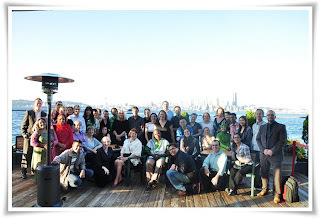 Some of us have also had the pleasure of f2f meetings in different countries worldwide and we all know, more or less, for most members of our group what they are up to, what they have done since Seattle, where they have traveled and how they have implemented the knowledge they gained at the Insititute.